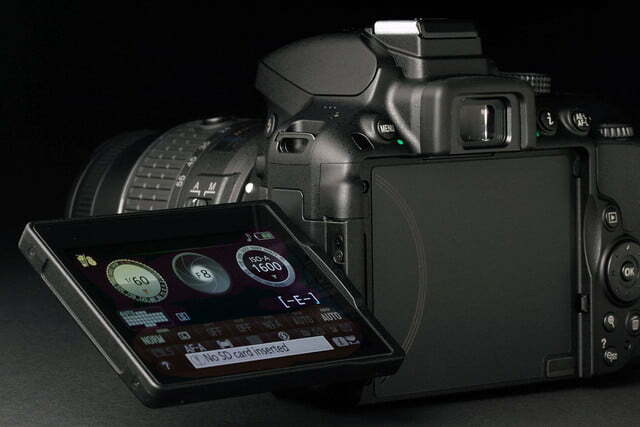 The D5300 takes too-notch stills and videos, and built-in Wi-Fi and GPS are real pluses. Nikon recently upgraded its sub-$1,000 DSLR line-up with the introduction of the D5300 ($750, body only), a camera that looks like a winner, or at least on paper. 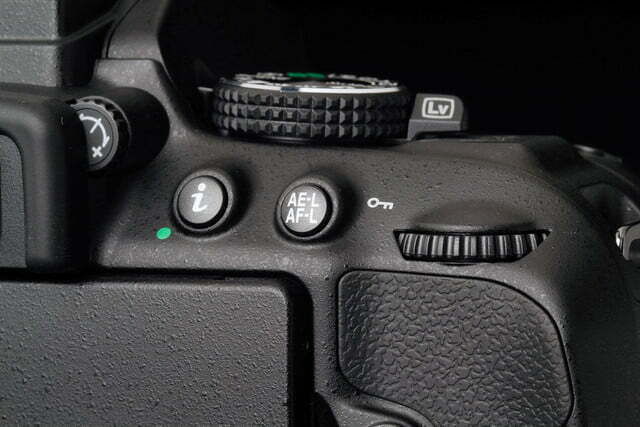 Along with a 24.2-megapixel APS-C sensor, it has built-in GPS and Wi-Fi – two firsts for the company’s DSLRs. 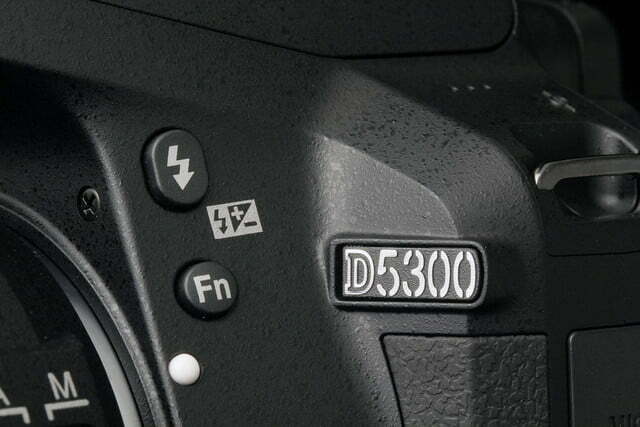 The D5300 has loads of other features, and it’s one of the better lower-end DSLRs you can buy. 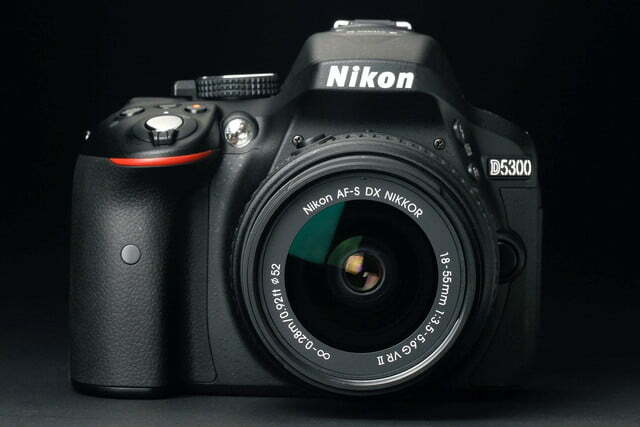 The D5300 looks like every Nikon DSLR we’ve reviewed over the past few years. 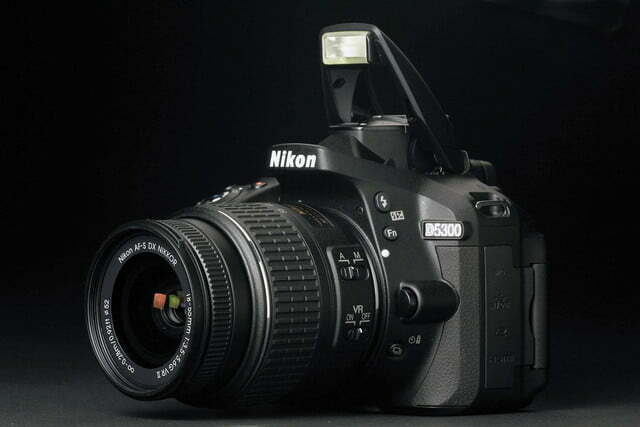 You’ll find no surprises here, and it looks very much like the D3300 tested a few months ago. In fact, they are the same size (4.9 x 3.9 x 3 inches) but the D5300 weighs a fraction more (17 ounces versus 14.5, body only) due to its 3.2-inch vari-angle LCD rather than a fixed display. The “handle,” or grip, feels comfortable but you should always do your own hands-on test before you buy. The D5300, however, feels more like an entry-level DSLR compared to enthusiast-grade models such as the D7100, a long-time favorite of ours. 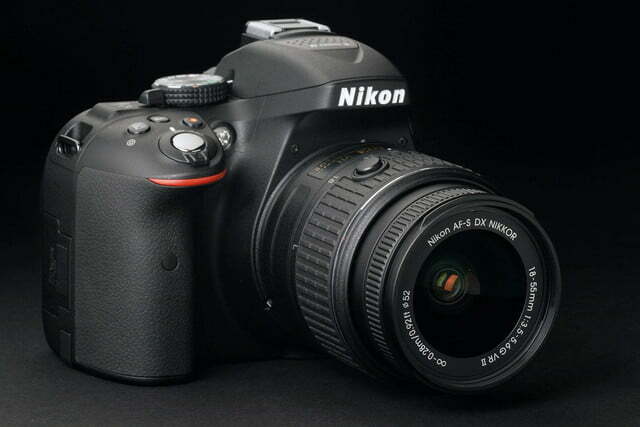 The D5300 borrows a few features from it, but simply doesn’t have the nice heft and feel. 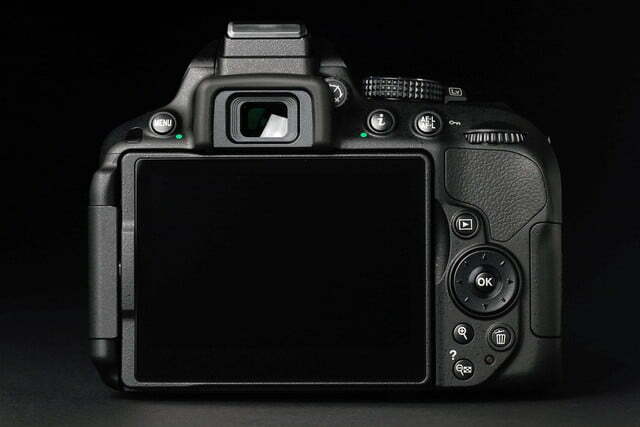 This is to be totally expected since the D7100 costs over $400 more. 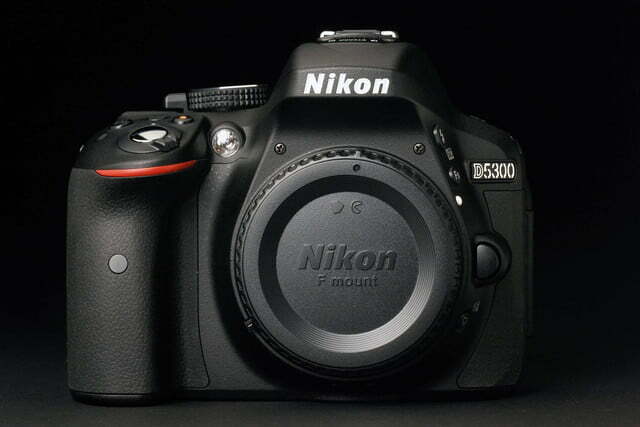 If all-black doesn’t work for you, the D5300 is also available with red or blue accented bodies. 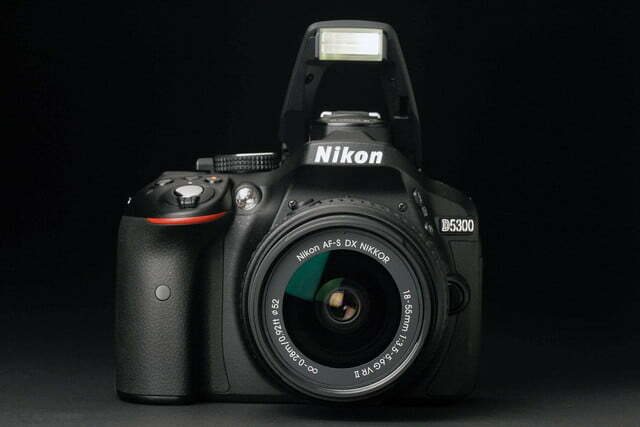 The D5300 is similar to the D3300, except Nikon eliminated the anti-aliasing filter for enhanced sharpness. 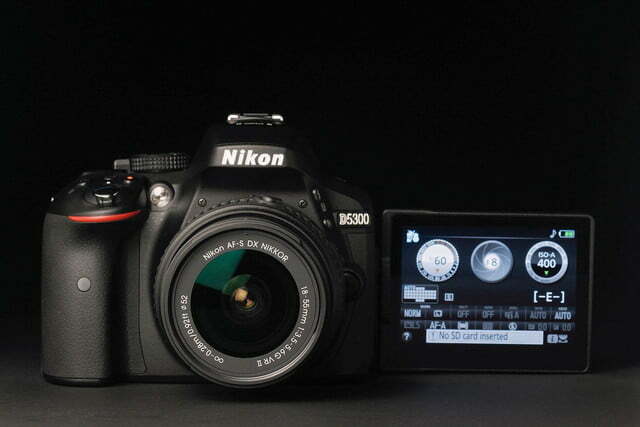 The D5300’s basic kit lens is an 18-55mm f/3.5-5.6 G VR II (27-82.5mm in 35mm terms), which costs $849. Unless you’re a newbie, opt for the body-only setup to choose the lenses you want, or pick the $1,049 18-140mm VR (27-210mm) package for greater telephoto range. The top deck has a pair of stereo microphones; since we lambasted Nikon for offering only mono recording in the D3300, this is most welcome. Your Full HD 1080/60p videos now have the two-channel soundtracks they deserve. Also here is a speaker, hot shoe, auto pop-up flash, and a mode dial. 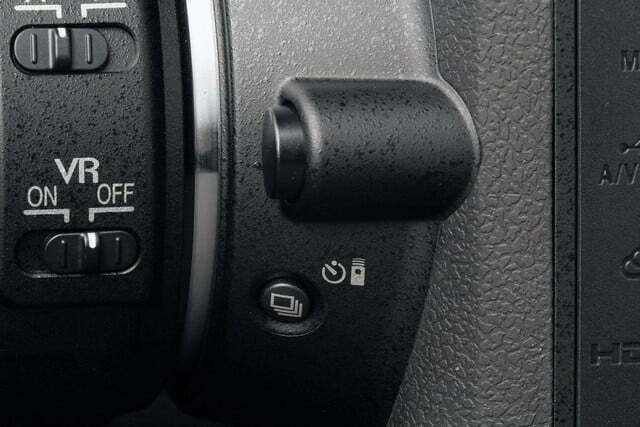 Next to the dial is a lever to quickly move into Live View. 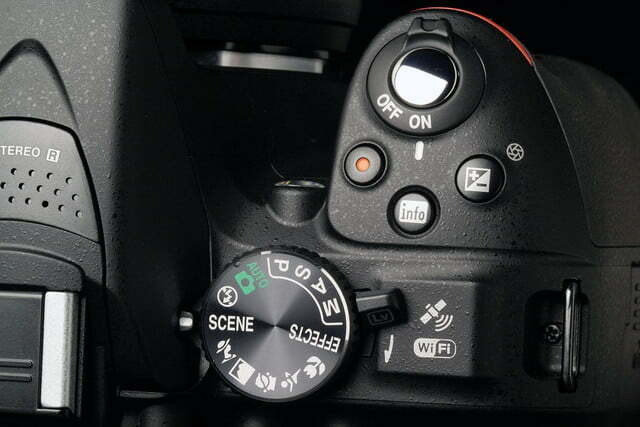 On top of the grip are red-dot movie record button, and Info and Exposure Compensation buttons. The Info button is similar to the Display button from other brands; it regulates what appears on the screen, from bare minimum to a crowded mess of numbers and icons. 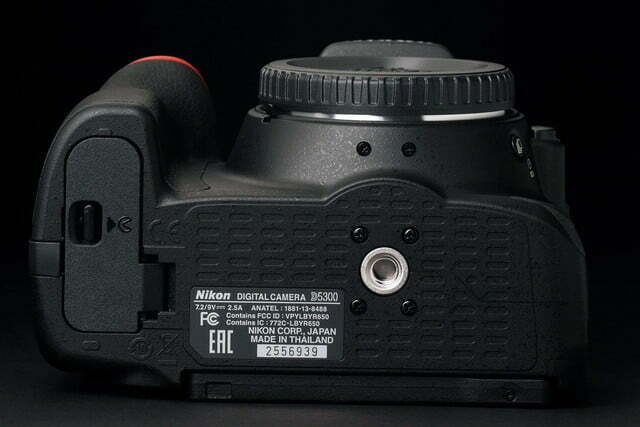 On the rear are two critical DSLR features: optical viewfinder and LCD screen. 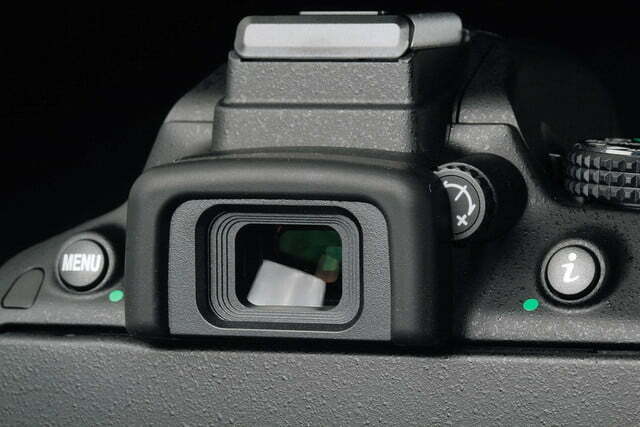 The viewfinder has a 95-percent field of view, but is a bit dim. The 3.2-inch swivel screen is rated a nice 1,037K dots, and holds up well in direct sunshine, once you turn up the brightness levels. We like vari-angle screens since you can hold the camera in a variety of positions. This is one of the major pluses of the D5300, making it closest to the 18-megapixel, Canon EOS Rebel T5i, which also costs $849 with an 18-55mm kit lens. 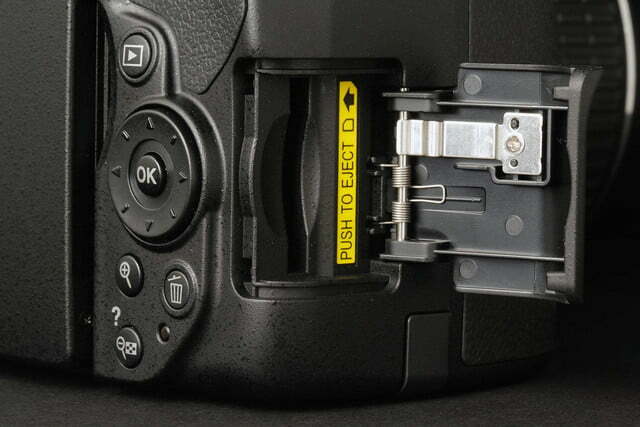 You’ll find many typical DSLR buttons surrounding the screen, including Nikon’s “I” button that provides access for imaging parameters (ISO, white balance, exposure compensation, aperture, shutter speed, etc.). 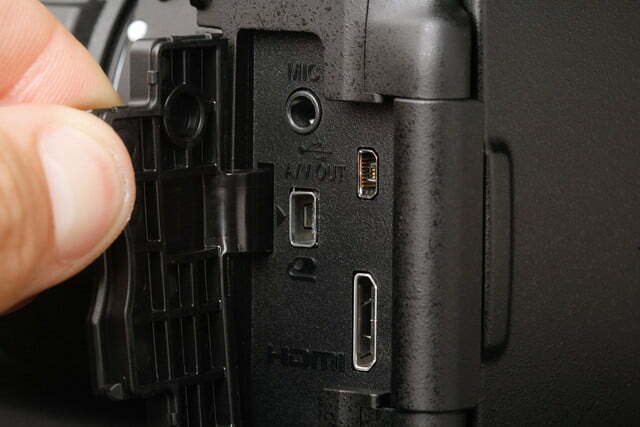 On the right side is the SD card compartment, while on the left you’ll find a variety of inputs (external mic, accessory) and outputs (A/V, HDMI). 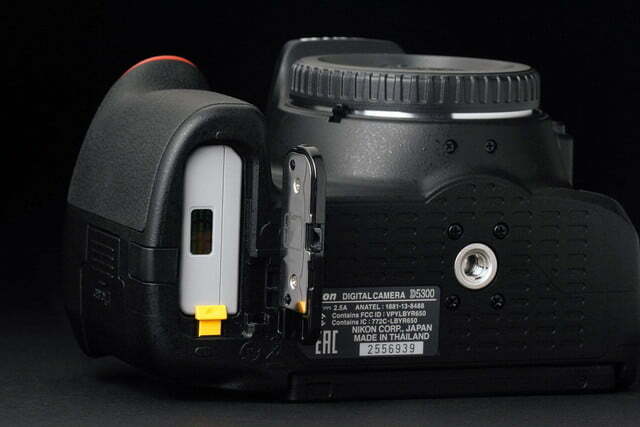 Also near the lens mount are pop-up flash, Function, and Burst mode buttons. The Function button can be customized to any of nine settings (ISO is the default). 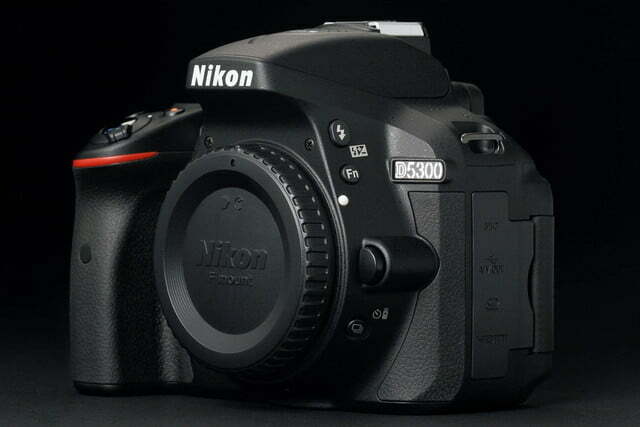 The D5300 is highly customizable, so you can really dig into its potential. The battery is rated for 600 shots – a good number and much needed with the onboard GPS and Wi-Fi, which are notorious energy hogs. The GPS drained our battery quickly when we left the camera in standby mode overnight, so turn the DSLR off completely during idle periods. You’ll get the D5300 body and any kit lens you decide to purchase. There’s also the battery, plug-in charger, and various caps, as well as a strap. There’s a nicely-done 86-page printed User’s Manual and two CDs – one containing the ViewNX2 software for handling files and processing NEF/RAW images, while the other has the full 300-page manual. Nikon offers a one-year limited warranty. It also offers a two-year extended service coverage in select states, for an additional fee. 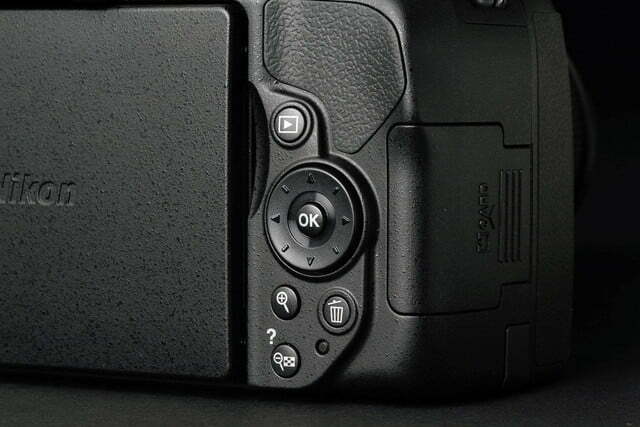 The D5300 has a 24.2MP APS-C sensor coupled with the EXPEED 4 processor, just like the D3300. 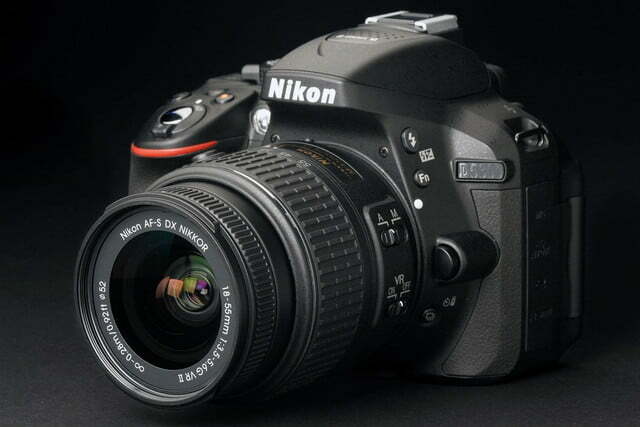 With this model, however, Nikon eliminated the optical low-pass (anti-aliasing) filter for enhanced sharpness. Many CSCs (compact system cameras) and DSLRs – such as the new Nikon D810 – have dropped the filter and embraced the trend. Any attempt to improve image quality is a positive in our book. 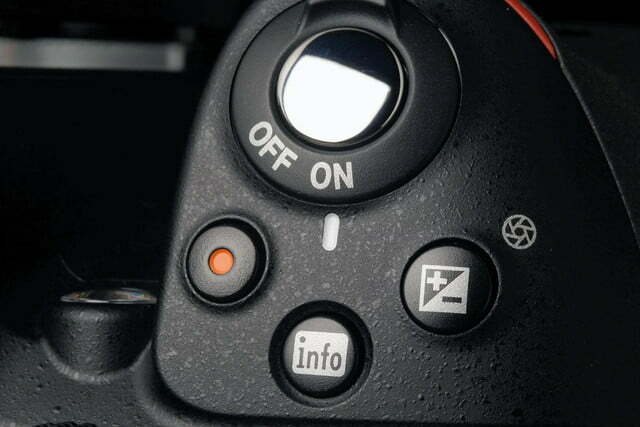 More important is an improved autofocus system compared to the D3300. Here it’s 39 AF points instead of 11, which means faster and improved focusing. 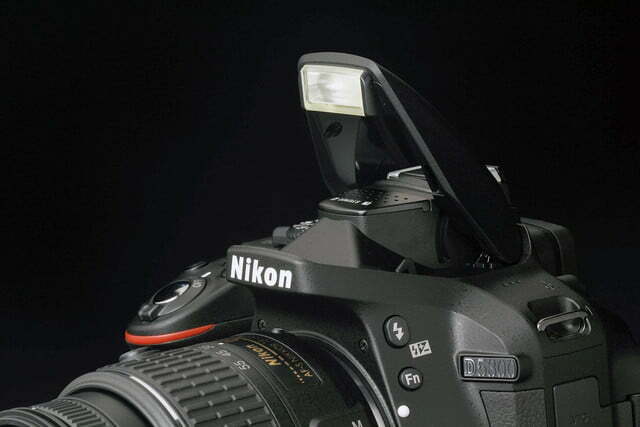 Nine are cross-type sensors versus just one for the D3300. It’s not the 51/15 of the D7100 but that’s a much more robust and expensive DSLR. 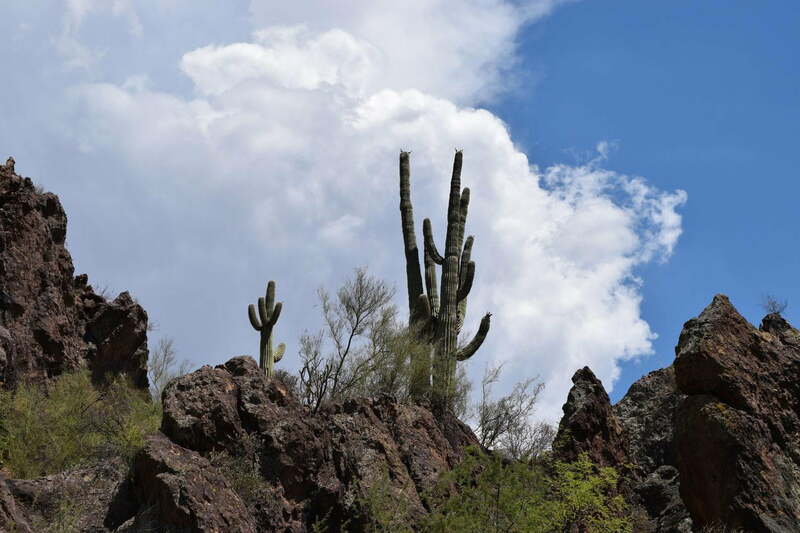 For an entry-level camera, the D5300 captures excellent stills with nice details and colors. 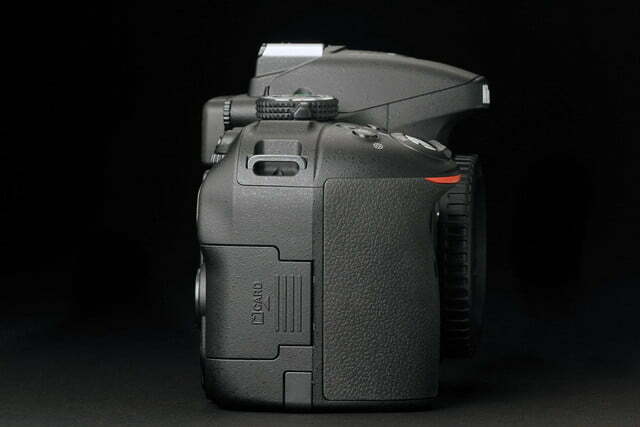 As for ergonomics, we find the D5300’s body a bit plasticky, but the grip has a nice rubberized texture. Buttons for the most part are accessible, and the GUI is fun to use. 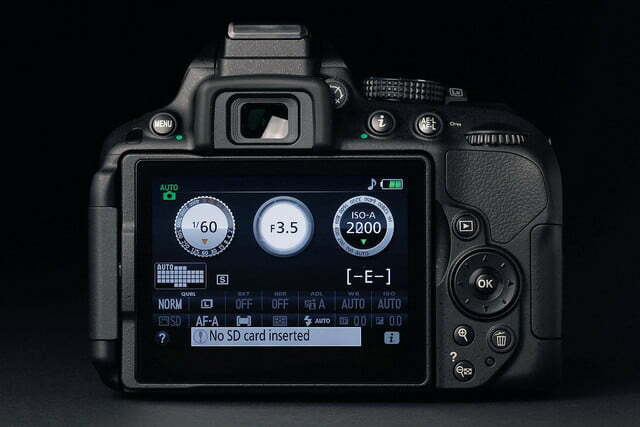 Change the shutter speed, for example, and a virtual dial turns on the LCD to give you a large readout of the setting. This is very accommodating and welcoming for casual shutterbugs, and it’s just one of the reasons we prefer Nikon’s lower-priced DSLRs to Canon’s, such as the EOS Rebel T5. For testing, we set the camera to maximum still and video resolution (6000 x 4000 pixels, 1080/60p) and then proceeded to move through the command dial. There’s the green auto mode as well as auto with flash off. There’s the traditional PASM and not-so-traditional Effects, which has nine options including HDR Painting (creating a painting-like photo through two additional exposures); there’s also the classic HDR (high dynamic range) buried in the menu system. 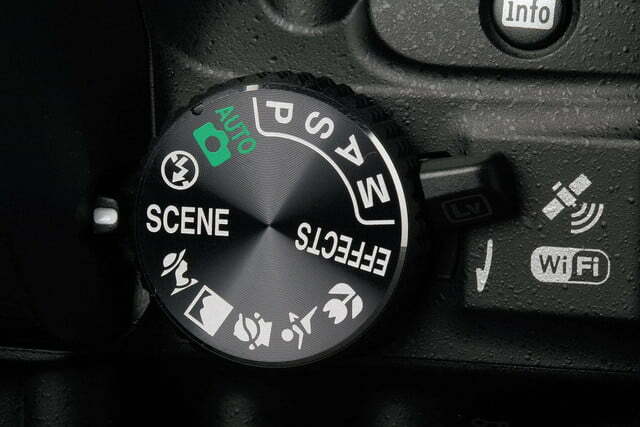 In keeping with its accessibility to everyday shooters, there are five commonly used Scene options readily available on the dial. There are an additional 11 options under the Scene setting. 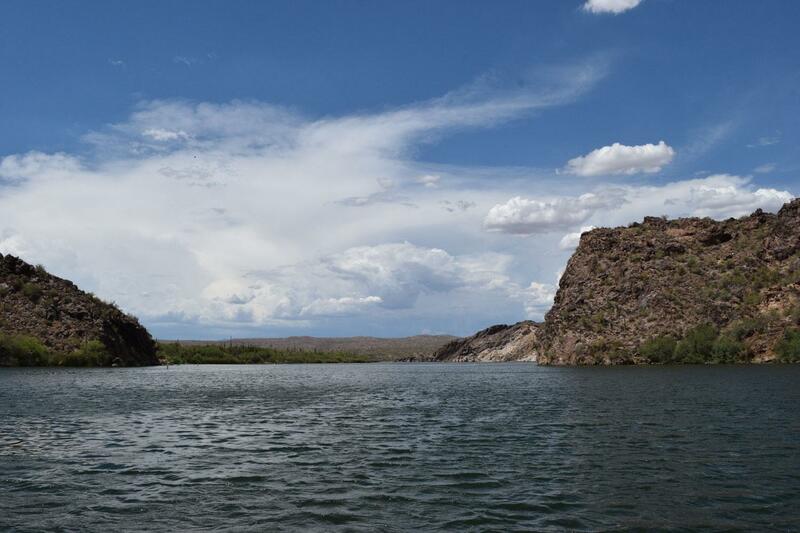 We used the D5300 in our Southwestern test bed to capture classic landscapes and speedy jet skiers. 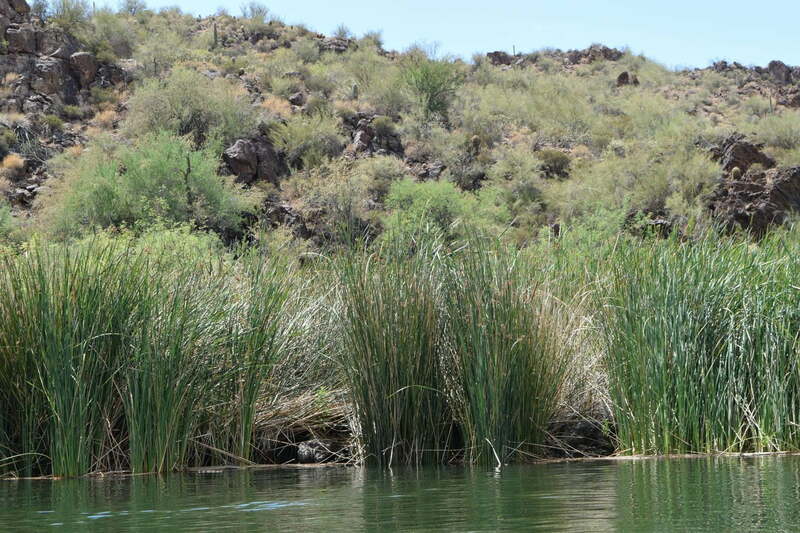 Our results were very good, but with one caveat – the very limited 18-55mm kit lens. 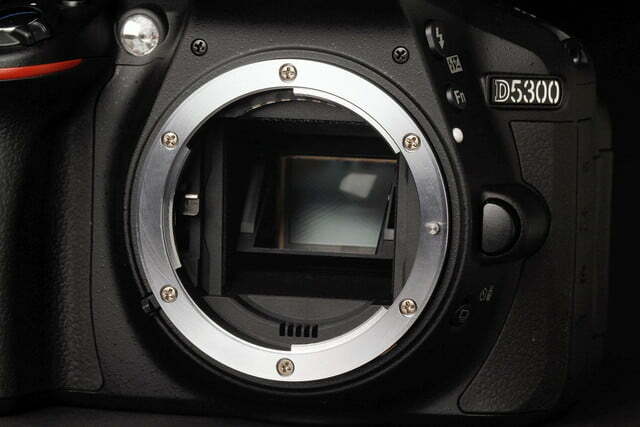 We felt this way with the D3300: this camera is not justly served by this limited piece of glass. It’s simply not wide (aperture) or long enough (telephoto). Even with this lens, we must admit the D5300 captured some excellent stills, and colors were spot on with plenty of detail. 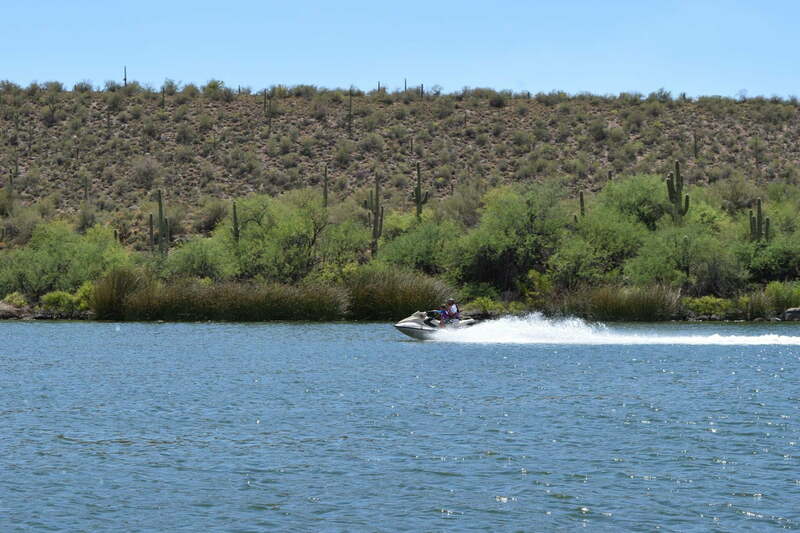 While at Saguaro Lake in Mesa, Ariz., we shot jet skiers speeding by and, with a 5-frames-per-second burst speed, got good stills. Focusing was very fast and there were rarely any issues of grabbing. Granted, it doesn’t have the top shutter speed of an enthusiast DSLR (1/4,000 versus 1/8,000) but the results were still impressive. Because of the lens’ limitations, we really had to enlarge them on the 27-inch monitor to see the results. With the right lens, there’s no doubt this would be a good DSLR for budding photographers. Besides jet skiers and boats, the camera did the job with more prosaic subjects such as kids playing in pools. We wouldn’t push the ISO too much since noise will be noticeable at higher settings (see below). 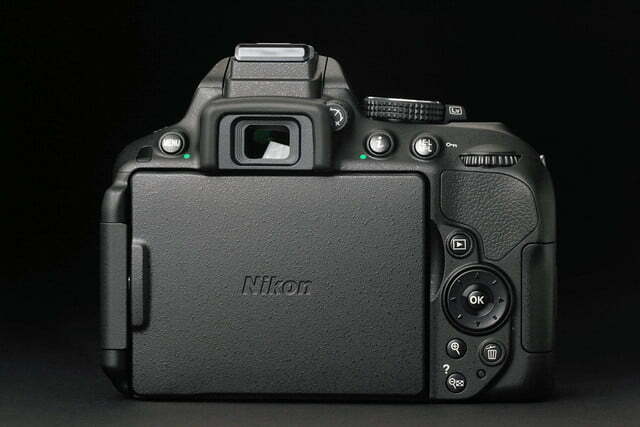 A real plus for the D5300 is built-in Wi-Fi, a first for a Nikon DSLR. Pairing your smartphone with the Nikon Wireless Mobile Utility (iOS/Android) is relatively simple, working through the Menu settings under Set-up. Once connected, we quickly transferred more than 600 images in just a few minutes to our older Droid 4 smartphone. 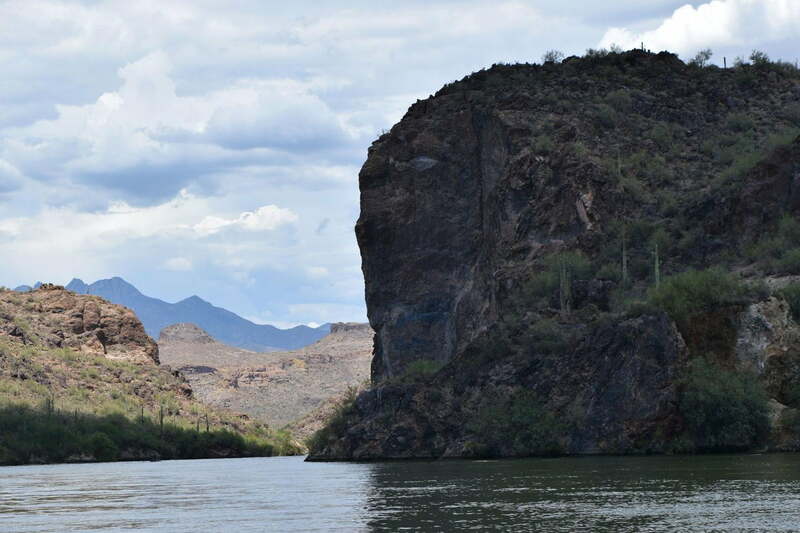 From there, it’s easy to share photos, and you can use your phone as a remote shutter too. To save battery power, we suggest you disconnect the pairing once you’ve done your chores. We’re quite pleased Nikon has gotten with the program and no longer forces you to buy an optional Wi-Fi adapter. Most new Nikon compacts and CSCs already have built-in Wi-Fi, and it won’t take long before all its DSLRs have it too – it’s just the evolution of the camera industry in this highly connected world. We already warned you about the battery-draining aspects of the built-in GPS. Still, it’s a good feature for adding longitude/latitude/altitude/time metadata to your files. Using the supplied NX2 software you can track your logs to revisit your specific locales – definitely a positive for roaming shutterbugs. 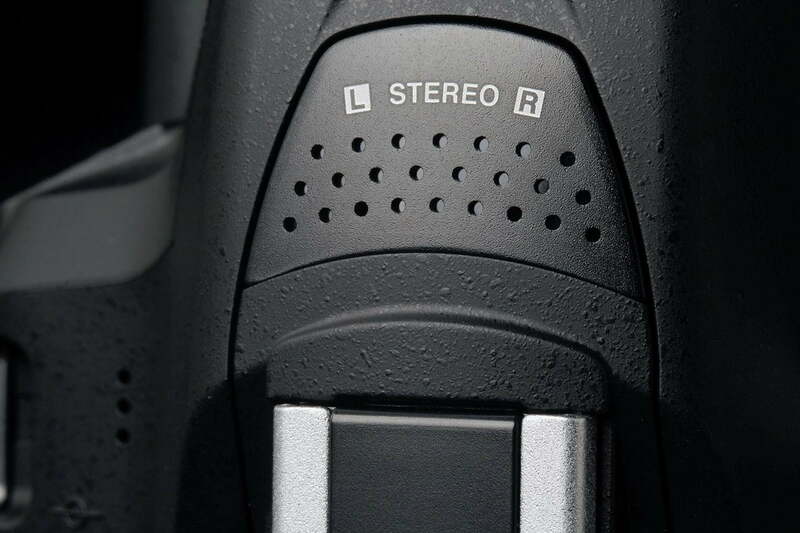 The D5300 captures 1080/60p videos with stereo sound, and they’re quite good. We definitely liked the color rendition and exposure. Focus was rapid and on the mark. We shot some kids playing in a pool and the results were among the best we ever achieved with a Nikon DSLR. The same held true for boats and jet skiers. You’ll like the clips a lot. For the most part, we were impressed with the ISO capabilities of the D3300, and the same held true for the D5300 (it should since it’s the same sensor/processor combo, minus the AA filter). 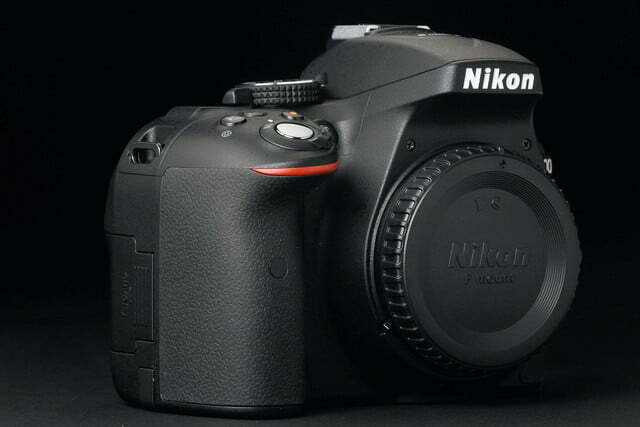 The Nikon has a native range of 100-12,800, with three extended settings that eventually hit 25,600. The results were solid up to 1,600, and you might get away with a small-sized shot at 25,600 if you were desperate. Noise raised its ugly head as you moved up the scale, with a gentle fall-off in overall quality as you turned the jog wheel through the many available levels. We wouldn’t go beyond 3,200 or 4,000. The D5300 is a very good entry-level DSLR – which in our view are sub $849 kits – and earns our Recommended status. Stills and videos are top notch and the built-in Wi-Fi and GPS are real pluses, and that vari-angle LCD takes it to the next level. The real negative is the 18-55mm kit lens that’s just too limited for anything but the basics. If you need a kit lens, buy the 18-140mm kit or just the body and any lens that matches your photographic vision.